Christmas is a great time of year for celebratory drinks, ‘get togethers’ and buying gifts. Choosing the right present can also be frustrating as you may not know what to get your loved ones. What do you buy a wine enthusiast that already has everything? They might already have a wine decanter and all the glassware they require and the perfect corkscrew to withdraw the cork. We’ve listed below our ‘Top 5 different wine gifts’ that we hope will bring a smile to the face of the wine enthusiast in your life this Christmas. These XL Wine and Champagne corks make for great pieces of furniture, whether it’s for a stool to sit on or a side table for you to rest your glass of wine on. With various designs and prints, these fun and quirk giant corks make for a great gift. Made from 100% sustainable Portuguese cork, they not only look fantastic, but they’re robust, stable and innovative. Price from: £109.95 – Click here to view more. 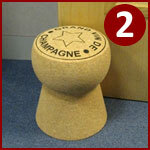 This champagne cork shaped door stop will certainly raise a few eyebrows when you welcome your guests for Christmas dinner! The champagne cork is weighty enough to stop doors from closing and it will add a bit of character to your room wherever it sits. 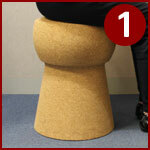 Part of the XL Cork range, this innovative solid natural cork door stop is great for any home. Price: £44.50 – Click here to view more. Drinking wine at the correct temperature is vital to enjoying it at its fullest potential. 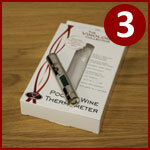 This modern wine thermometer will read through glass within one second, you don’t even need to pop the cork! It’s simple to use and reads the temperature accurately. It can be used to read the temperature from either the bottle or the glass. Simply place the All Temp Wine Thermometer on the centre of the bottle / glass, press the button, read the digital display, easy! Price: £24.99 – Click here to view more. Our selection of de long wine maps cover the greatest and most popular wine areas found around the World. The metro wine maps in particular feature the wine loving country of France and the heavily populated area of California in the USA. 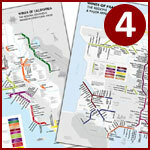 These two large wine producing areas are well presented and informative in the metro map format. Other de long wine maps are also available in the standard form, for France, California, Italy and the Iberian Peninsula (Spain / Portgual). Price: £17.75 – Click here to view more. Recording notes of a wine collection or simply taking notes as you try and taste new wines is a good way to compare different wines. Our selection of different notes books and wine logs will certainly help the wine enthusiast in your life! They are not only ‘input based?? ?’ but educational and informative too, helping to understand the different phrases and words associated with wine. Price from: £5.50 – Click here to view more. Wineware’s top 5 quirky and different Christmas wine gifts are all available to buy online or over the phone. Click here if you wish to view our other Wineware Christmas gifts. Alternatively, let your friends & family decide which wine related gifts they’d like for Christmas, with a Wineware Gift Voucher.